Cedar Crest Hospital West Wing Final Piece of Steel. 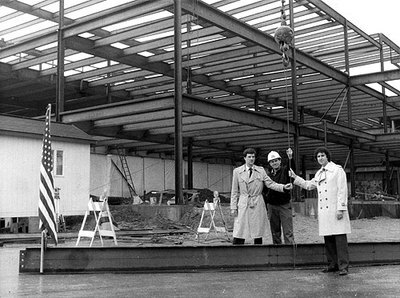 The final piece of steel in the West Wing project at Lehigh Valley Hospital Center/LVH Cedar Crest Hospital was placed Nov.24,1986. on hand for the occasion were project Engineer Greg Butz (from left), construction Superintendent Jim Lamb and Hospital Vice President Lionel Kier. The addition would later be named the Carl R. Anderson Wing, for the hospitals building committee chairman. The Wing initially for administrative use, but the hospital later got approval to open a unit there for open heart surgery patients.